6 188 ms 188 ms 189 ms ten-0-2-0-650.bdr02.syd03.nsw.VOCUS.net.au [114. 13 192 ms 191 ms 191 ms bundle-ether6.ken-core4.sydney.telstra.net [203. Pretty much anything to Australia is bad again. New Zealand servers and websites seem to be okay. What's the issue? Running Belkin ADSL with D Link Router. This has happened in the past. I haven't tried restarting yet. I wonder if last night's international outage, lasting 30 minutes or so, was some "planned work" changing their routing - I've heard that there was some work done on this last month. I still see problems accessing some international sites today. There is a network issue in Wellington but our team are onto it right now. I was having an issue accessing international sites the last day or so. 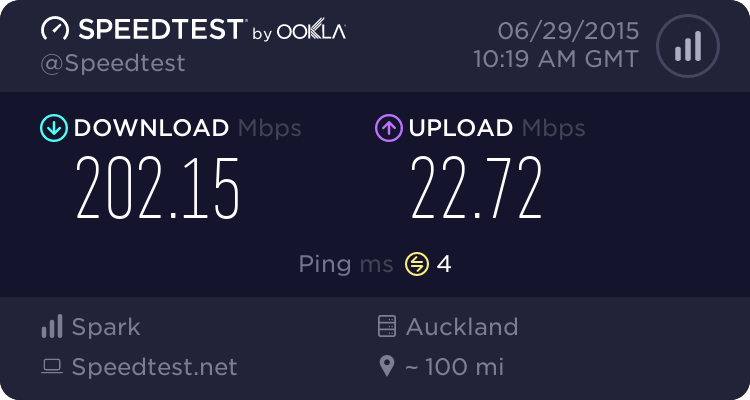 I notice at the moment that my connection is running at 119Mbs/10Mbs 25ping - usually I am lucky if I get anywhere near 30Mbs down. freitasm: It's happening again tonight. I barely just caught the ping spike but not enough time to trace rt. It seems it is stable again. Might be a five minute glitch or a quick tweak. Either way I'll leave this here. I noticed some serious jitter. Possible still spiking? 6 110 ms 62 ms 60 ms ten-1-0-0-640.cor02.syd03.nsw.VOCUS.net.au [114. I stopped it after 9. is it me or am I observing some serious jitter? Possibly a ping spike? From what i understand there have been upgrades on the "Vodafone" ADSL customer side that have taken place. I have been having huge packet loss and ping spikes. (Apparently a "Faulty" port, Not to mention it was checked 5 days ago by chorus.) If i run a basic trace route to trademe. It takes about 2 minutes to complete and pings very inconsistent. I try to play Dota 2 and get a constant ping of 300ms-400ms and packet loss of 30%-80%. The issue isnt constant but very frequent at peak times. I will see how it pans out and hope for VDSL at some time in the future and that the routing is resolved. I will usually see the issue between the router and the BRAS (Most likely hinting a congestion hand over point or port issue) or between us a Vocus for international traffic. What kind of upgrades are we looking forward to? Stability upgrades or better routing or just overall performance. Because if it's just that then I can understand why it's been happening. kiwikiwi: What kind of upgrades are we looking forward to? Stability upgrades or better routing or just overall performance. Because if it's just that then I can understand why it's been happening. Something i wouldnt be able to answer even if i knew. freitasm: It seems it is stable again. Might be a five minute glitch or a quick tweak. Its been doing that for a few days now....and it isnt fixed contrary to the VF spin team.